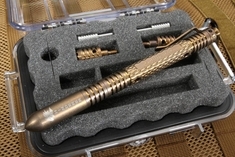 We are a Hinderer Pens Authorized Dealer. 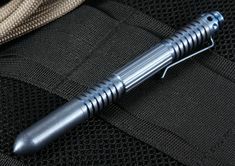 Rugged and designed for harsh environments, Rick Hinderer tactical pens are a must-have for military personnel, law enforcement professionals and others who need to be prepared for anything. 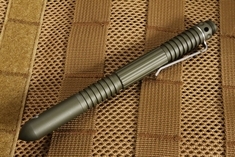 At KnifeArt, we carry an extensive selection of these American-made tactical pens so you can choose one that suits your personal sense of style while giving you the ability to protect yourself whenever necessary. Choose between lightweight and highly effective models such as the Rick Hinderer Extreme Duty in blue anodized titanium or blasted titanium. 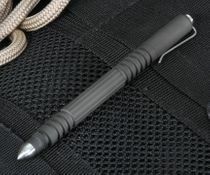 These tactical pens feature horizontal and vertical lines along the body that provide an unparalleled grip when you need it most. 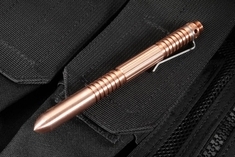 With a titanium pocket clip and an easy to remove cap, this 2-ounce pen measures 5.25 inches long when the cap is on. 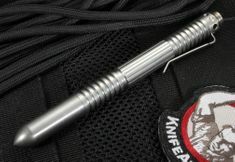 We also carry Rick Hinderer Investigator pens, which are known their fantastic traction that can be used effectively in close-quarters combat. 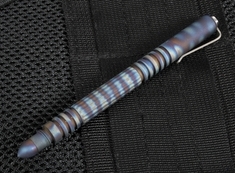 These pens are made from aircraft-grade 6061-T6 aluminum with a MIL-SPEC type 3 anodized hard coat. 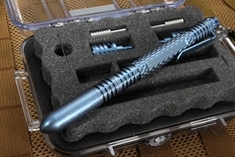 Investigator pens are available in black, blue, green and blasted titanium finishes; we also have copper, flamed titanium, bronze and stainless steel. 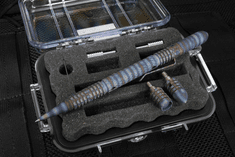 Many people come to KnifeArt looking for Rick Hinderer Modular Kubaton Delux pen sets because we carry them in bronze and blue anodized titanium; we also have them in blasted titanium and flamed titanium for people who like an edgier color to their tactical pens. 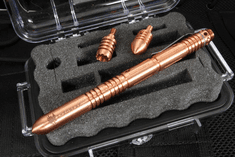 These Kubaton Delux pen sets come with everything you need for self-defense (and for writing, for that matter). 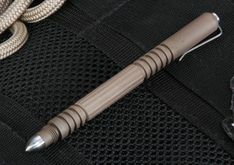 When assembled, a Kubaton Delux tactical pen weighs 2.6 ounces and measures 6.25 inches long; the set includes a pointed tip, a jagged-edge tip and a long, slender spike. These pens come with a Fisher Space Pen Pressurized #PR4B black bold refill, which allows you to write in the most extreme environments. Whether you're shopping for yourself or for someone you care about, our extensive collection of Rick Hinderer tactical pens contains exactly what you need.